Depending upon where you live, you might find these birds with their iridescent feathers charming or a pest. However you view them, I think we can all agree that this vintage pigeon image is quite nice. 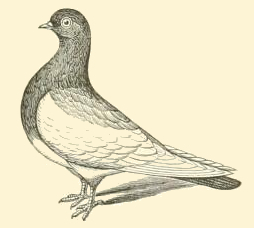 This black and white bird image shows a single pigeon standing on the ground and casting a small shadow. It is so much fun finding vintage books full of wonderful illustrations. Thomas E. Hill’s 1882 work Hill’s Album of Biography and Art provided over 200 drawings for this site.